Argentinian ex-Real Madrid and Liverpool midfielder signs for Derry City F.C. Derry City has signed an Argentinian born midfielder who was on the books of both world football giants, Real Madrid and Liverpool. Gerardo Bruna (28) was once touted as the "next Lionel Messi" and was also referred to as the "Messi of Madrid" when he spent five years as a member of the youth setup at Real Madrid from 2002 to 2007. Derry City manager, Declan Devine. Bruna reportedly rejected a contract offer from Real Madrid preferring to sign for England football giants, Liverpool, where he would remain from 2007 until 2011. Unfortunately for Bruna, the potential he displayed when he was younger failed to materialise to the degree Liverpool would have wanted and he was sold to Blackpool in 2011. Bruna would go on to have spells with Huesca in Spain, Tranmere Rovers, semi-professional English club, Whitehawk, Accrington Stanley and Ottawa Fury in Canada. Bruna has also represented at international level for Spain U17s and Argentina U20s. Former Rangers player Darren Cole (pictured above) joins Derry City F.C. for a second spell. Elsewhere, Derry City boss Declan Devine has also announced that central defender, Darren Cole, has joined the club for a second time. The ex-Rangers centre half was a regular at the heart of the Candy Stripes' defence when he joined the club in June 2017, however, he announced his departure from Foyleside at the end of November last year when his contract expired. With just 10 days before the start of the 2019 Airtricity League campaign Cole becomes Declan Devine's tenth signing and could be set for a swift introduction in Tuesday's friendly fixture away to Ballinamallard. Meanwhile, Institute F.C. 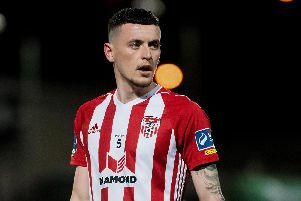 captain, Michael McCrudden, has signed an 18 month pre-contract with Derry City but will not join until June when he finishes this current season with Stute. Devine is hopeful of bring another few new faces on board before the end of the week with Colchester United striker, Junior Ogedi-Uzokwe awaiting international clearance before completing his six month loan deal from the League Two outfit.